We wrote a lengthy article with tricks to save on the food bill while still eating great food, but I wanted to add something similar in an easier to read point form format easily usable as a reference. This way, it’ll be easy to consult and take out new ideas or get a refresher about some nice tricks to save money while on Paleo. The result is a list of 25 tips and tricks that will help you save an appreciable amount of money over time. I’ve tried to include diverse tips that will appeal to a wide range of people with different personalities or priorities. Here they are, presented in no particular order. Eat organs: Organs are the cheapest sources of meat available and are also often the most nutritious sources at the same time. Liver, for example, is really cheap and is a nutrient powerhouse. Other tasty and cheap organs include: heart, kidneys, sweetbreads, tongue, marrow, … Some are an acquired taste, yet others just need a great recipe to make you forget you’re eating an actual organ. Liver pâté is an absolutely delicious way to eat liver. Participate in a farm share: CSA (Community-supported agriculture) programs and farm shares are getting more and more popular and there is no reason why you shouldn’t take advantage of this cheap, fresh and local source of food. When the season approaches, get in contact with your local farm share program to be sure to get on board on time. Buy half a cow: Buy a used chest freezer and buy your meat in bulk either with cow pooling where you’ll put money in common with others to buy meat in bulk or by simply buying half a cow, bison or lamb for yourself. You’ll spend a chunk of money all at once, but will get some of the best grass-fed meat money can buy for an unbeatable price per pound. As a plus, you’ll get to cook all the cuts, which will force you to discover new tastes and cooking techniques. Don’t waste anything: Less than a century ago, most people knew how to use up everything they had and were very efficient with their resources. Make sure you keep all the bones for making stock, save the pan drippings to cook other meals and make sure you use your fresh produce wisely so you don’t end up throwing away some of it because it has lost its freshness. Get rid of unnecessary things in your life: Some people refuse to spend more for grass-fed meat and complain about Paleo food being too expensive, yet still drive in fancy cars, have the cable with a gazillion stations and live in enormous houses. Necessity is the mother of invention and when you realize the link between food and health, longevity and well-being you always end-up finding ways to save elsewhere so you can spend more on food. Remember that there is always a way. Thrift cuts: Learn to cook tougher cuts like shoulders, shanks, trotters, hocks and oxtail. Those cuts will require slow cooking in a liquid, but will yield an unbelievable taste for a very small price tag. Get a good crock-pot and get used to prepare delicious stews with those cuts. As a bonus, you’ll get bones that you can use to make stock. Become friends with local farmers: You’d be amazed to see the money you can save once you become known by local farmers and start buying frequently from them. You’ll soon have very interesting discussions with them and they’ll often give you some of their less popular items like bones, organs or fat for free as a gift for being a loyal costumer. Visit the farmer’s market at the end of the day: Near the end of the day farmers often have to sell out some of their produce or else it will go to waste and they will offer great deals to those who are still hanging around the market. Don’t buy organic: This might seem counter-intuitive, but oftentimes organic food is over-hyped and not worth the markup difference. Keep your money for local meat and vegetables instead of buying overpriced organic vegetables that traveled halfway across the world. Grain-fed better than no meat: In times when you’re really tight, you should always keep in mind that grain-fed meat, even though not optimal, is still way better than eating grains, legumes or dairy products. While I think that buying grass-fed is accessible to most people when properly planned, you shouldn’t be scared to follow a Paleo diet only because you can only buy the conventional meat found in grocery stores. Buy in bulk: When some items become on sale or are in season, buy a large quantity and learn to keep it either by freezing, preserving or fermenting. Also, some items are much cheaper when bought in large quantity. Olive oil, for example, is much cheaper when bought in those large gallons than in the smaller glass bottles. Prepare things yourself: Make your own stock, dressings, mayonnaise and other condiments and make it an habit to prepare food from scratch and only buy the basic ingredients. 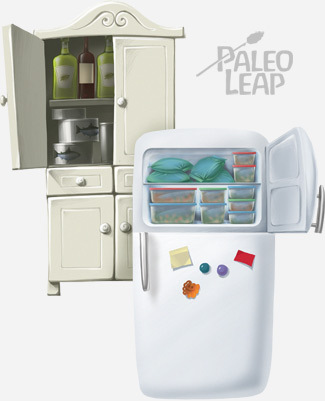 This is less of a problem for people on a Paleo diet, but a lot of money is usually lost on prepared food. Make a budget: Budgeting is a great way to see where the money goes and to keep extra expenses to a minimum. Fancy Snacks, coffees at the coffee shop and eating out are three ways where extra money is often spent that can easily be limited by following a budget closely. Stick to simple meals: Build most of your meals with an animal protein source, a pile of simple vegetables and a good animal fat and you’ll eat great food that’ll be easy to prepare and cheap all at the same time. Refer to my quick Paleo meal roundup for ideas. Grow your own food: A vegetable garden in the summer will not only help you save money, but growing food is a fun and healthy activity where you connect with nature and take a good dose of vitamin D.
Eat less: I don’t really like this one, but when times get really hard food quality is more important than food quantity at the end of the day. Our ancestors certainly experienced times of scarcity where they would eat much less for a while. You can also practice intermittent fasting to be able to eat less without feeling hungry all the time. Go fishing or hunting: This will of course require quite a bit more planning, but it can become a new hobby of yours and a great way to take some time off of your regular life. Those two activities will bring you even closer to your food and you’ll be enjoying it even more. Pick your own food: When in season, go at your local orchard to pick-up fresh fruits. Also, be on the lookout for wild berries, they are delicious and a gift from nature. Plan ahead: Planning is a big part of success in any endeavor. If you plan your meals and expenditures ahead of time, you won’t be surprised by extra costs here and there and you won’t be scared that you won’t be able to make ends meet. Render your own fat: Coconut oil, butter and extra virgin olive oil are without a doubt delicious, but you can easily get some pork, duck, beef or lamb fat from your butcher or farmer’s market and render it yourself for pennies on the dollar. You might have to ask your local farmer for it ahead of time since almost nobody asks for it. Farmers will be glad to sell it to you for a very, very low price. Recognize what you already save: If you keep in mind all the money you used to spend on unhealthy snacks, lunches and expensive prepackaged food, you’ll realize that you might not be spending that much more than before. Also, eating a Paleo diet means saving on drugs and future medical costs, and this has no price really. Follow sales and use coupons: Use coupons or ask for a rain check and buy in large quantity when something interesting becomes on sale. Eat more carbs: Paleo is more about food choices than a specific macro-nutrient ratio. Some people choose to eat more carbohydrates in the form of starchy vegetables like sweet potatoes, carrots, beets, yams or even regular potatoes and experience the same great health effects as those eating less carbs. If you’re healthy and don’t have extra weight to lose, starchy vegetables are a good source of cheap energy and nutrients. Choose cheap or in-season vegetables: Make sure you don’t spend a good part of your food budget on vegetables because there are always ways to get them really cheaply. Buying them when they are on sale, buying frozen vegetables and buying them in-season from your local farmer’s market are three examples.